Rabbis, cantors, civic leaders, and a bereaved aunt gathered on July 30th to lead 1,000 sympathists at the Temple of the Arts in Beverly Hills to mourn Israel's civilian sons & fallen soldiers who were sacrificed to protect the safety of the Jewish nation. Simon Wiesenthal Center's Rabbi Marvin Hier addresses the gathered: Treating Israel differently than the rest of the world is anti-Semitic. Aunt Leehy Sha'er eulogizes nephew, Gilad, and his friends Naphtali & Eyal sacrificed from to lead IDF to terror tunnels and avert catastrophe. Sam Glaser tells the genesis of his inspirational, jihad-resistor ballad, "One Hand, One Heart", which he performed with a live choir at the memorial for Israel's fallen. Pastor Kevin Diekleman describes the activism of his group One Heart for Israel. He discusses public perceptions of the media depictions of the Gaza incursion. (Advance using menu button on lower right). 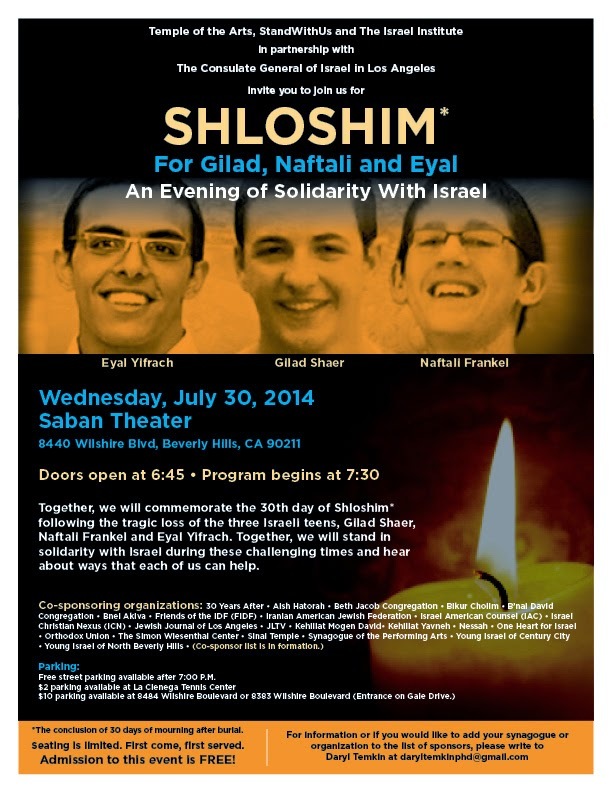 Rabbi Daniel Pinner's Shloshim eulogy to Naftali, Gilad, and Eyal in L.A. Shloshim ceremony. "Blessing for the State of Israel" - Cantor Netanel Baram & Israeli Consul Generale David Siegel with choir.